Point of sale (POS) software systems offer a host of benefits to retailers and other business users. Retail businesses realize the many advantages of POS software over cash and are actively using it in their outlets. As a result, the POS terminals market is growing at a rapid pace and is predicted to exceed $124 billion by 2024. If you are searching for a quality POS software system for your needs, you have come to the right place. In this article, we detail the key features and benefits of Vend and top 10 Vend alternatives to help you make the perfect choice. Vend is a POS software platform designed for iPad and is widely used by numerous retail businesses to manage inventory, sales, and customers at an affordable rate. The solution is flexible and responds to both touchscreen and keyboard and mouse. Plus, the POS screen can be modified to easily access popular processes and items. Vend is designed to work seamlessly with existing equipment, hardware, and systems such as cash drawers, barcode scanners, receipt printers and others. You can run this software on a web browser on any device (PC, Mac, Android, or iPad). This iPad POS app can be easily downloaded from Apple’s App Store. It is a hybrid web and mobile POS app that can be customized for the needs of any business in any industry. Besides retail, it can be also used in other sectors like food service. It offers premium features and scalability that grows as your company expands. If you want advanced functionalities, you can get the value-added options. The platform is configurable and affordable. It integrates smoothly with popular business systems such as Xero and Shopify. If you wish to look beyond Vend, don’t go away. We also evaluate the main features and benefits of 10 top Vend alternatives. You get valid reasons to consider the alternative app instead of Vend and vice versa. A cloud-based restaurant management application, the primary function of Toast POS is to give restaurateurs absolute visibility and control over all their processes. This feature-rich tool has capabilities that include online ordering, labor and inventory management, CRM and credit card processing. The software eliminates the need for additional hardware unlike traditional POS, resulting in savings for users. Its has APIs that allow the system to seamlessly integrate with popular third-party apps. If you want to try the features for free you can easily sign up for a Toast POS free demo here. The tool’s restaurant management capabilities come in the form of time-specific menu set up, pricing and customization. A restaurant ordering capability allows users to split bills and menu items among customers while automatic notifications are generated whenever an order is ready. Taking orders is a breeze with the system, resulting in much faster restaurant service. Lastly, the app comes with a ‘pay at the table’ feature, enabling users to print receipts, send email and tip servers all from tablet computers. Toast POS can be purchased in flexible and customized pricing models. Pricing starts at $79/terminal for the tool, $899 for hardware, along with a flat processing fee. You can directly contact the vendor for a customized quote. If you want to see more options there are good Toast alternatives. 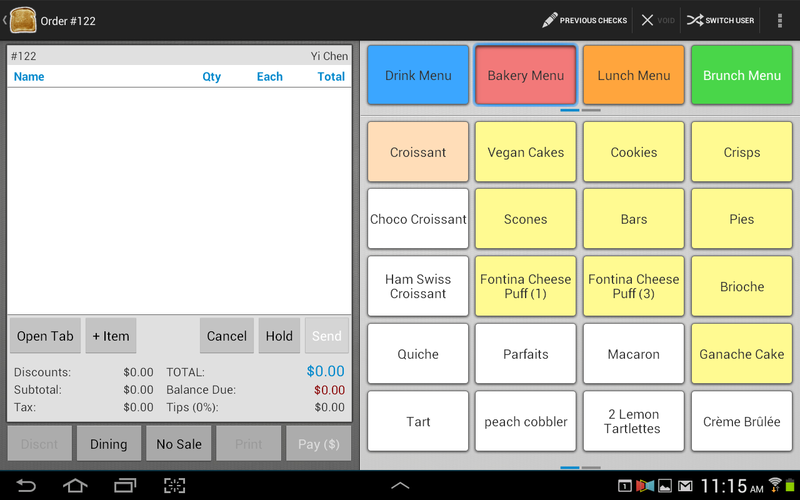 Popular restaurant POS software TouchBistro caters to the needs of all types of restaurants and is designed to run on iPad. The platform is known to increase sales and improve business decisions and restaurant service. Functionalities such as tables and floor plans management, inventory, staff scheduling and table side orders management come with the solution. The vendor is offering a comprehensive free trial. You can sign up for a TouchBistro free trial here. Being a cloud-based platform, TouchBistro can be accessed anywhere at any given time, meaning all features, including analytics and features can be used whenever and wherever they are needed. Designed for food service, the product is easy to use and comes with advanced management features, making it highly-suitable for any food establishment. TouchBistro comes in flexible pricing schemes, all of which are billed annually. Its Solo plan comes for $69/month for 1 license. A Dual plan is priced at $129/month for 2 licenses. Its Team package comes for $249/month for 5 licenses while its Unlimited plan is priced at $399/month. If you feel that you need more features, check out these TouchBistro alternatives. Why Choose TouchBistro Over Vend? Why Choose Vend Over TouchBistro? Square is a free, reliable, and fast POS application that enables businesses to take payments using their Android or Apple iOS device. It can be implemented on the counter or on-the-go. The solution comes with free downloadable software and a Square magstripe reader, allowing you to take credit and debit card payments. It can also be used to track real-time sales and inventory, and to manage items. You can easily try out this solution with a great free trial offered by the vendor. You can sign up for Square free trial here. If you think this platform is too basic for your needs, feel free to look at these good Square alternatives here. Why choose Square over Vend? It is a free application available from Google Play and the AppStore. Customers can pay, tip, and sign on your device. You can send and track invoices from your device. Record gift cards, cash and other forms of tender. Why choose Vend over Square? Retailers can easily manage their products, and organize and monitor their customer base. The real-time dashboard gives them instant visibility enabling them to make vital decisions on sales and products. The vendor offers reliable support on multiple contact channels. Miva Merchant is a popular eCommerce solution that is one of the good Vend alternatives as it offers a great set of features for modern businesses. The best part is you get full price value because of its effective functionalities. Numerous top companies in the US have utilized this product to notch up more than $100 billion in sales over the past 20 years. Visit their website and take an online tour to learn about the software’s offerings and features. These features include: revenue tracking, analytics, subscription management, automated emails, and real-time prices. For more choices, browse these good Miva Merchant alternatives here. Why choose Miva Merchant over Vend? You can design your platform architecture the way you like. The data is hosted by the provider so you need not worry about maintenance and support. The Miva interface is highly customizable and responsive. Your customers can use search options and libraries to easily find their desired products. Why choose Vend over Miva Merchant? Its paid packages are more affordable compared to Miva Merchant. The vendor provides fast staff training. It facilitates refunds, returns, and store credits. Clover is an integrated POS platform that is designed for the needs of small and medium-sized restaurants. It offers custom hardware and can be deployed using web-based and server options. This app stands out because it helps retailers effectively manage their business in real time. With Clover, you can edit menus, oversee inventory, and supervise your employees efficiently. Plus you can utilize its reports and insights to make smart business handling decisions. The software also provides convenient POS payment facilities including debit and credit card payments and Apple Pay. If you wish to look around for more choices, peruse these viable Clover alternatives here. Why choose Clover over Vend? It is a user-friendly product that enables retailers to manage business from any device. It offers a high-speed printer that also functions as a connection hub. It features pre-configured tools that facilitate effortless inventory management. You can easily edit product information making it simpler to track product performance. Why choose Vend over Clover? It offers order management and cash management features. It is optimized for mobile. It centralizes data for easy access. You can use it to manage sales, inventory, and customers. QuickBooks POS is another of the viable Vend alternatives as this robust platform empowers users to effectively track sales, inventory, and customers. It is offered in two versions, Basic and Pro. The app is designed to help businesses tackle their customer service needs. It tracks customer information and offers useful tools to improve customer retention and loyalty, and motivate them to make repeat purchases. For instance, you can track consumers’ past purchases and learn about the brands and products they prefer to buy. Main features include: standard discounts, loyalty rewards program, credit card processing, barcode scanning, and multiple stores/inventories. To offer you more options, we present good QuickBooks POS alternatives here. Why choose QuickBooks POS over Vend? You can deploy it as a web-based, on premise, or mobile POS solution. It offers additional hardware such as barcode scanners and receipt printers. The interface is user-friendly and easy to learn. It automatically updates your inventory and you don’t need to enter information manually. Why choose Vend over QuickBooks POS? Besides retail, it can be also used in other industries such as food service. It is a hybrid web and mobile POS solution that can be customized for your specific business needs. The POS screen can be modified for effortless access to popular items and processes. ShopKeep is a complete iPad POS tool that is designed to serve the needs of quick-serve businesses such as fast food franchises, retail outlets, restaurants, bars and others. It offers a ton of capabilities to empower users to easily manage marketing, inventory, staff, registrations, and booking. The app can be deployed in minutes and offers an intuitive and user-friendly touch screen interface. In short, retailers can use this reliable and fast software to effectively run their operations. Top features include: reporting and analytics, seamless changeovers, payment processing, register harmony, and integration and add-ons. If you feel this app is too basic, feel free to look at good ShopKeep alternatives here. Why choose ShopKeep over Vend? You can process transactions quickly and keep the customer queue short and moving. It offers robust inventory management tools. It provides its own card processor so you don’t need to set up another one. It captures customer information and populates the data for email marketing processes. Why choose Vend over ShopKeep? It is a configurable and affordable POS platform. It provides premium features and effortless scalability to meet your company’s growth. It is designed to be compatible with existing systems and hardware. Retailers can use it easily manage their products, organize and track their customer base. 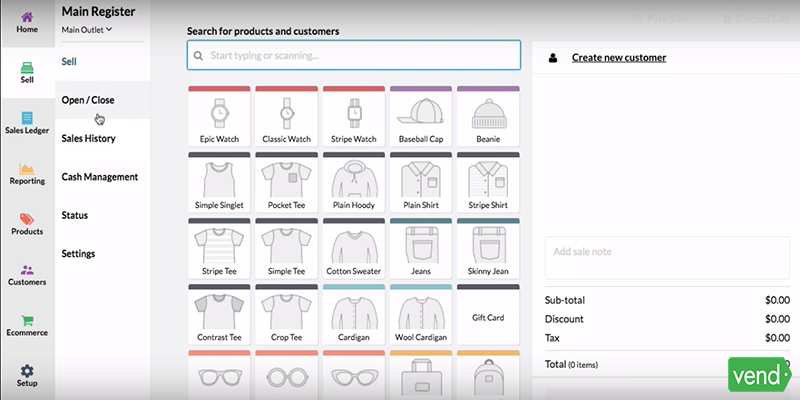 Salesforce Commerce Cloud combines mobile-first point of sale (POS) and store operations, order management, digital commerce, and predictive intelligence in a single package. It helps to streamline business operations from purchase to post-sale service. The app offers three modules: intelligence, operations, and experience. These three modules combine to power commerce across multiple channels such as call center, store, kiosk, web, mobile and others. The system is powered by a shared personalization and promotion engine to offer you a unified view of business information on customers, products, prices, and orders. To give you additional options, we present good Salesforce Commerce Cloud alternatives here. Why choose Salesforce Commerce Cloud over Vend? It enables you to manage product-level inventory availability. It creates a fast path between your ideas to execution. You can launch new sites or execute promotions in days or hours, not months. You can utilize the role-based, intuitive user interfaces to control the brand experience and site functionality with minimum IT help. Why choose Vend over Salesforce Commerce Cloud? It integrates seamlessly with leading business apps such as Xero and Shopify. If you want advanced features, you can buy the value-added options. It facilitates mobile and contactless payment. You can work offline if the internet connection goes down. FastSpring is an ideal tool for websites looking to hawk SaaS, software, apps, and digital products to businesses. This app has been designed by eCommerce experts and has been around since 2005. It is equipped with the latest technologies that help to maintain eCommerce engines and databases. FastSpring offers innovative features to increase your sales. A big plus point is you can leverage it to connect with your international clients while maintaining privacy and security. The vendor has won several awards especially for their outstanding customer service. If you wish to scout around for additional choices, feel free to browse these excellent FastSpring alternatives here. Why choose FastSpring over Vend? It is available in more than 20 languages to enable online stores to sell internationally. It accepts payments in more than 12 currencies. You can easily customize all your pages yourself. You can effortlessly control everything from order pages to shopping carts. Why choose Vend over FastSpring? It offers a free package. It offers order management and cash management tools. Shopify POS is designed for iPads and iPhones, and empowers you to manage your online and physical stores using a unified solution. It is part of the Shopify eCommerce suite and enables you to manage your business from anywhere. The full POS system offers you Shopify’s proprietary card reader (powered by Swipe), a Socket Mobile barcode scanner, APG cash drawers, and a Star Micronics receipt printer. The drawback is you need to buy one of the newer iPad versions to use this platform. Plus, you need to utilize compatible hardware for everything to integrate smoothly. If you feel this application is too complicated, choose another one from the viable Shopify POS alternatives here. Why choose Shopify POS over Vend? It offers all the benefits of the Shopify eCommerce platforms. This allows you to accept payments from multiple channels (online payments, credit cards, etc.) without worrying about third-party fees and restrictions. You can manage your retail business using a unified interface and save a lot of time. It comes with an intuitive design and a reliable customer support system. Why choose Vend over Shopify POS? The real-time dashboard gives you instant visibility enabling you to make smart decisions on sales and products. You can avail vendor support as well as community support (for the free plan).